Many strategies have been devised over the years for improving performance of wireless sensor networks with special consideration to energy efficiency, accuracy of the sensed data, increasing network lifetime, providing QoS, et cetera. Such techniques include design of various MAC protocols, routing algorithms, aggregation techniques, and many more. Data fusion has been developed to be one of such techniques that has a span of benefits across all the above mentioned performance criteria. The basic concept of data fusion is to apply various mathematical concepts on the raw sensor data to achieve an output with better fidelity and accuracy. Various mathematical, signal processing, and probabilistic techniques can be implemented to fuse the data. This might be done for decreasing the volume of the data, improving the precision of the data, deriving an inference from the raw data that was not present earlier, and many other similar functions. The motive of this chapter is to introduce data fusion and why it is important in case of wireless sensor networks. Further, it classifies data fusion, explains the major techniques, models, as well as the implementation aspects of data fusion, and concludes with the challenges and limitations posed for data fusion to be useful. With the emergence of numerous interfaces as well as standards in the domain of wireless transmission and communication systems, the world has noticed a substantial amount of research towards developing high-end and compatible devices that are sought to be lighter and quicker in respect of seamless connectivity as well as user end requirement. While the initial development was restricted to infrastructure-based networks which were integration of wireless plus wired networks, the latest research have produced purely wireless networks without any fixed backbone called as ad-hoc networks in which wireless entities form a network among themselves on requirement. 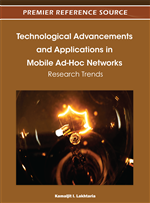 Various classes of adhoc networks have been profound namely Mobile Adhoc Network (MANET), Vehicular Adhoc Networks (VANET), etc. The underlying principle that differentiated these variations of networks are the entities involved in formation of the adhoc network. While VANET is formed between fixed devices mounted on high speed vehicles, MANETs are formed between low speed portable devices with low end computing needs. Interest in MANET arose due to its ability to provide distributed and instant wireless networking solution in situations where infrastructure based networks are unfeasible and expensive to be deployed. Moreover, they have greater flexibility towards congestion and robustness towards single-point failures. A variation of MANET is Wireless Sensor Network (WSN) is a novel technique proposed for countering the numerous challenges of real-time, non-real time and various event-driven applications like habitat monitoring, surveillance, target tracking [Akyildiz et al. (2002)] with an ad-hoc network of cost effective and easily deployable micro-sensors. These micro-sensors made of MEMS technology are resource-constrained in the terms of power, processing ability as well as memory. The sensors are randomly spread into the field of operation and might remain unattended. Once deployed the sensors self-organize into a network without intervention of any other support. These specify unique characteristics of WSN, i.e. self-organization, random deployment and unattended operation. Moreover, WSNs are application-specific implying that the network and hence its various parameters vary with the application they are used for. The resource-constrained nature of sensors and the unique characteristics of WSN imposed several difficulties in their practical realization, like battery consumption, scalability, sensing accuracy and coverage, to name a few. Rather than developing new protocols for these types of networks, researchers thought of modifying the existing network protocols to suit the demands of WSN, so that they can be implemented with ease and minimum of complexity. Accordingly, both hardware and software based approaches were devised towards forming a practically useful wireless sensor network. The hardware-based approaches concentrate towards designing low power consuming, accurate and reliable computational modules of a sensor. These include design of low power consuming transceiver, decreasing size of the mote through VLSI (Very Large Scale Integration), adopting specific modulation techniques, choosing between various channel coding and error coding techniques for transmission over the unreliable wireless channel. The software-based approaches intend to modify the existing network protocols or developing newer algorithms to increase the efficiency of sensor network. Several such approaches are categorized under design of energy-efficient MAC protocols (Wang et al., 2007), developing various routing techniques (Al-Karaki & Kamal, 2004), clustering methods (Abbasi & Younis, 2007), in-network data aggregation methods Krishnamachari et al., 2002), and many-a-more. All these techniques use various optimization and protocol reduction techniques so as to remove the part of protocols that would have been an overhead for Wireless Sensor Network.